Chipping Norton situated on the western slopes of a hillside that was once the site of a Norman castle is the highest town in Oxfordshire. It is a lively town but has not been too affected too much by tourism. This real Cotswolds town with real shops is known as the ‘Chippy’ to the locals and also claims to have the last fish and chip shop for 30 miles in the Cheltenham direction. Market day is every Wednesday. There has been a market here since the 13th century and was once a major wool trading town in the 15th century. On the outskirts of the town stands Bliss Tweed Mill which looks like a cross between a mansion and a folly rather than a late 19th century factory. It has an unusual domed based chimney which is a landmark for Chipping Norton for miles about. The owner William Bliss brought the railway here to supply coal for his mill’s steam engines. The mill which made high quality Tweed for many years closed in 1980 and has now been converted to luxury apartments. Chipping Norton’s railway and station closed in the 1960’s. The church of St Mary, built in perpendicular style, has one of the finest interiors of all the Cotswold Churches thus reflecting the prosperity and wealth. The town hosts a museum, a theatre, the Almshouses and a Town Hall. The Town Hall which dominates the town is a proud symbol of the days when the town was a Borough and has gone under many changes over its 161 years. The Rollright Stones near the village of Little Rollright is a circle of standing stones with two others which stand close by. They are situated on either side of a road that follows the line of an ancient track way along a high ridge. This road was a very important route in prehistoric times and today it is called the Jurassic Way. 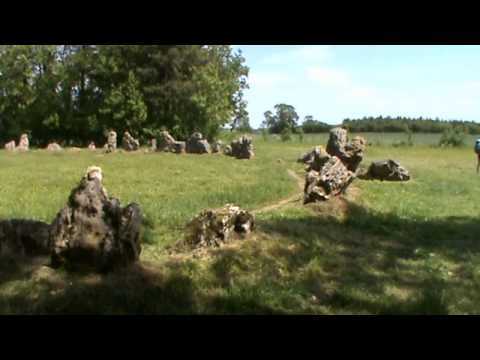 The stone circle, named the Kings Men Stone Circle, consists of 77 stones varying from ground level to about 7 feet high in a perfect circle of 100 feet in diameter. They were built between 4000 and 4500 years ago by late Stone Age people. On the other side of the road there is a single large stone called the King Stone which was probably erected about 3500 years ago to mark a Bronze Age cemetery and close by are round barrows or burial mounds. A short walk from the circle there are five large stones standing together, which can be seen across the field, called the Whispering Knights burial chamber. These were built over 5000 years ago and the stones would have marked the entrance to the chamber. It is not clear what the stone circle was used for but may well have been for religious and secular ceremonies. There are several local legends associated with the standing stones. Salford is a small village housing St Mary’s Church and the Black Horse Pub. Its name comes from a crossing in the London turnpike road and an old salt track from the Midlands salt mines. Over Norton is a pretty hamlet situated on the edge of a lovely wooded park and its little green has an unusual Victorian memorial. D’Arcy Dalton Way is a 66 mile long distance footpath and was created to mark the Oxford Footpath Society’s Diamond Jubilee in 1986. It takes its name from Colonel W. P. D’Arcy, a founder member of the Oxfordshire Field Paths Society formed in 1926 and defender of Oxfordshire’s rights of way. The route which leads you through some of the remotest and most beautiful countryside begins at Wormleighton on the Oxford Canal Towpath, passes over the Ironstone Hills, through Hook Norton and close to the Rollright Stones. It then heads into Gloucestershire for a few miles to the Thames path and then drops down to the Ridgeway at Waylands Smithy. From the Town Hall we head slightly down hill on the A44. At the park we turn right through the gate and bear slightly left through the park keeping to the left of the swings to an iron gate. We go through the gate and head forwards to cross over a little bridge. The path splits we take the right path towards the building on our right. At the tarmac track we cross straight over going through the gap stile then keep heading forwards to cross over the road and through the gate into a field. We bear left following the arrow. At the end of the field we go through the double gates cross over the track and turn left slightly downhill with the hedge on our left. We keep following the path to go through a small wood and cross over a stream and head forwards. When we reach Salford we follow the road to the crossroads, play park on the left, and turn right to Rectory Farm Trout Lakes. At the end of the tarmac track we turn left sign posted D’Arcy Dalton Way (also Shakespeare’s Way). After about 50 feet we turn right through the trees. In the field with the farm in front of us we bear left towards the trees. We cross over a stile and follow the path round the edge of the field at the back of the farm. When the ground starts to rise we turn right over the stile and head forwards through the wood. At the end of the wood we head forwards to the corner of the field turn right through the double gates and immediate left to follow the hedge on the left. We cross over a stream and a stile and make our way through the wood. We keep heading forwards through the little gates following the permissive path to Little Rollright. We pick up the D’Arcy Dalton Way again following the arrow for the Rollright Stones. We follow the footpath signs and at the road we cross straight over. We head forwards through the fields on the wide path to the wood. On reaching the wood we turn left. We head forwards to the large stones named Whispering Knights then continue following the path which turns left the Kings Men Stone Circle. We then cross over the road to the Kings Stone. We now retrace our steps past the Whispering Knights and when the wide path comes in from the right we turn left over a stile into the wood. At the end of the wood we turn right and follow the track. At the end of the farm building we go over the stile and bear right downhill to the corner of the field. We keep following the footpath signs then go through the gate at the bottom next to a pond. We head forwards with the hedge on our right. In the next field we bear slightly left towards the road. At the road we turn left. We follow the road and turn right at the y-junction sign posted Over Norton. We follow the road passing a view point to Over Norton. At the T-junction we turn right. When the road turns left we head forwards on the tarmac track sign posted Restricted Byway Salford. The track becomes a stone track and when it splits we take the left path we can see Chipping Norton on our left. When we reach some cut down trees we turn left following the yellow arrow with the hedge on our right. We make our way down to Chipping Norton following the track back to the Town Hall via the church. This is an easy walk on paths and tracks through fields and wooded areas. There are some stony and tarmac tracks and also some quiet minor road. Approx 7.8 miles allow 3½ hours using OS Explorer Map 191, Banbury, Bicester & Chipping Norton. Start point: The Town Hall in the Market Place. Chipping Norton is in the Cotswolds, Oxfordshire. From the M40 take junction 15 then take the A429 to Moreton-on-Marsh. In Moreton-on-Marsh turn left onto the A44 to Chipping Norton. Parking: The free parks in the New Street and Albion Street are long stay and in High Street is short stay. There are public toilets in the New Street car park just off the A44 and also adjacent to the Town Hall in the Market Place. For refreshments there are plenty of shops and a wide selection of restaurants, Inns and pubs.